Newdelhi:30/10/18:Union Minister of Commerce & Industry and Civil Aviation, Suresh Prabhu, said that as Commerce Minister he has to ensure that services sector grows as it contributes nearly 2/3 of India’s GDP. 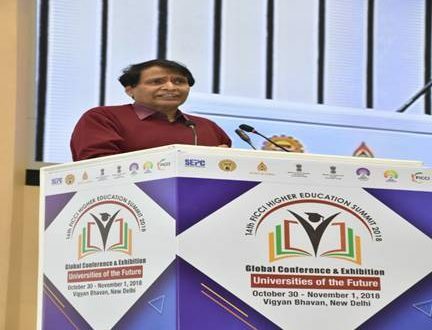 Addressing the 14th FICCI Higher Education Summit 2018 in New Delhi today Suresh Prabhu said that Government is striving to enhance the share of the services sector in total GDP of India and is making all efforts to achieve that goal. The ten Champion Services Sectors can push India’s growth in a big way. Suresh Prabhu said that education plays an important role in equipping students to utilize new opportunities in this sector. The Minister said thatalong with growth in GDP numbers, employment has also to be taken care of and the services sector can create more jobs for youth of country.